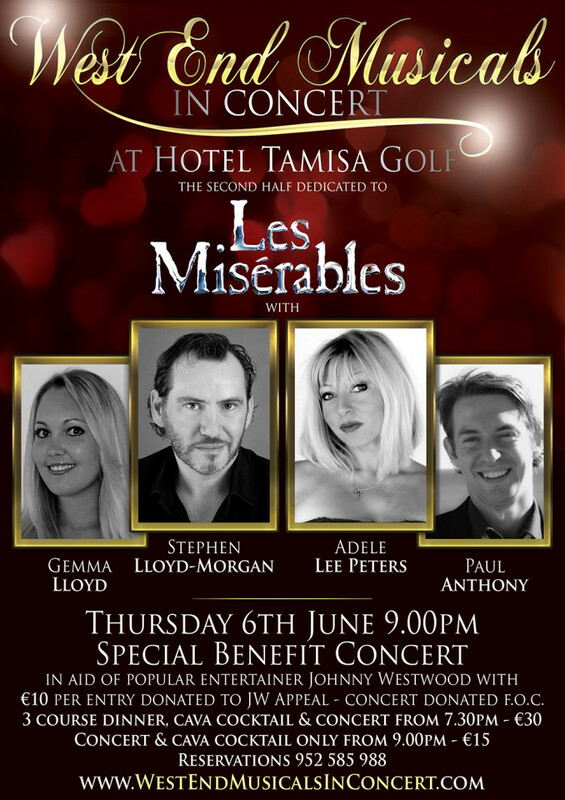 Special Benefit Concert in Aid of Johnny Westwood – West End Musicals In Concert – Thursday 6th June – Hotel Tamisa Golf, Mijas Costa | Marbella Marbella – Adelante! SPECIAL BENEFIT CONCERT in aid of JOHNNY WESTWOOD – WEST END MUSICALS IN CONCERT – THURSDAY 6th JUNE – HOTEL TAMISA GOLF, MIJAS COSTA. For ONE NIGHT ONLY you will get the chance to either have dinner followed by the Concert or to just attend the Concert. This SPECIAL BENEFIT CONCERT is being staged in aid of JOHNNY WESTWOOD who is one of the Costa’s most popular and much loved entertainers who has recently been diagnosed with cancer and is undergoing treatment! €10 per entry donated to the Johnny Westwood Appeal. Concert donated F.O.C. A DATE FOR YOUR DIARY BUT THIS IS ALSO THE ONLY “WEST END IN MUSICALS CONCERT” CURRENTLY PLANNED FOR THE MIJAS COSTA AND FUENGIROLA AREA SO PLEASE DON’T FORGET TO BOOK IN ADVANCE!